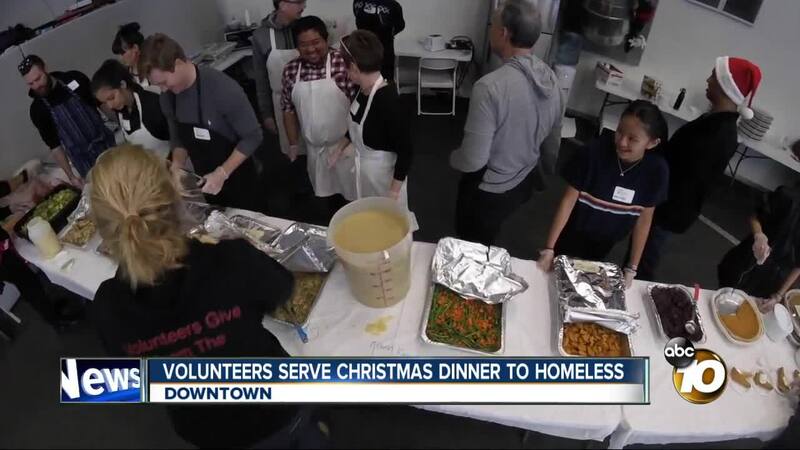 SAN DIEGO (KGTV)- This Christmas local chefs and volunteers gave the gift of gourmet meals for those in need. It was a two day process. “Just Call Us” Volunteers prepared the food, from scratch, before serving it to the homeless. The volunteers made enough to feed over 400 people. Early this afternoon, the chefs and volunteers delivered the food to three different shelters. The largest being the Alpha Project tent, in Downtown. “We all appreciate it. They all deserve a good meal,” says a staff member with the Alpha Project. Over a dozen volunteers donated their time at the Alpha Project. More volunteers visited Rachel’s Women’s Shelter and San Diego Center for Children. All of the items are donated from Specialty Produce, Cupcakes Squared and Sprouts Farmers Market. Just Call Us Volunteers gives back to those in need year around. They encourage everyone to come spread a little cheer throughout the year.